Mary Shelley in her classic novel Frankenstein observed that "nothing is so painful to the human mind as a great and sudden change". It's a fairly apt quotation to consider when looking back on the first year of Helloworld's existence, the single unified brand that could hardly describe its fledgling period of operation as one of unity. The Helloworld brand celebrates a year of existence on the 22nd of this month, but the change to a catch all marque has not pleased all parties. Travel Weekly's website is a case in point. Yes, it needs to be acknowledged that online platforms are notorious hotbeds of anonymous dissent. But it is striking that for all the coverage provided over the past year, the overwhelming number of comments when the topic of Helloworld was raised were negative. Agents at established chains like Harvey World Travel, Jetset and Travelworld have railed, perhaps ironically, against a loss of identity and a general lack of transparency during the transition process. Circumstances did not help Helloworld's top brass in the crusade for the hearts and minds of former Jetset Travelworld Limited agents either. No sooner was it revealed that the company was undertaking an internal cultural health check in March, than inaugural chief executive officer Rob Gurney tendered his resignation. Gurney, a Qantas senior management veteran, was brought onboard to oversee the transition period. He joined Helloworld as man with a reputation for business acumen and the ability to get things done, but also as a divisive character. Perhaps Gurney was the wrong man for the business, but with his departure and subsequent replacement by former chief financial officer Elizabeth Gaines, the time has come to ask whether things have really been that bad for Helloworld. Following the release of information to the Australian Securities Exchange in late June the company has seen its ranks shrink by 7%, compared to December 2013 figures, but senior management remain undeterred. Speaking exclusively to Travel Weekly, Gaines was eager to focus on the promise of the future rather than the travails of the recent past. "Helloworld has been on a strong upward trajectory since the day we launched the brand. Our target has always been to unite 1000 travel agents across the retail models of branded, associate and affiliate locations," Gaines said. As it stands at the time of publication the Helloworld network had "close to 900 locations… and secured key partners such as American Express and Orbitz", Gaines added. On the strength of these figures there's certainly reason for Helloworld to be bullish about its future. There have been other coups in its early period of existence as well. An early signatory as an associate member was leviathan South Australian travel agency chain Phil Hoffmann Travel. For Peter Williams, chief executive officer of Phil Hoffmann Travel, the opportunity to become an associate member of Helloworld was a case of all the planets aligning at the right time. 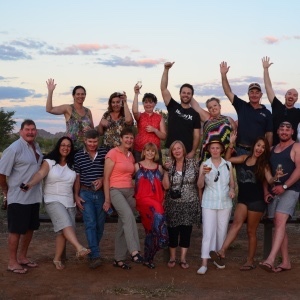 "Phil Hoffmann Travel has had a long association with Travelscene American Express and the respective senior management teams. The value proposition put forward by the newly branded Helloworld certainly stacked up well and as a Helloworld associate it allows Phil Hoffmann Travel to continue to trade under its owner banner, but with the added power of a strong national buying group," Williams said. And while it is tempting to speculate that some extra incentives may have come the way of Phil Hoffmann Travel for its early endorsement of Helloworld, Williams said this was not the case. "The incentives in place were simply the value proposition presented by a strong management team, a consolidated brand and a willingness to create a strong alternative for independent agents in the Australian travel industry," Williams said. Another voice in the Helloworld choir is Stacey Daley, owner of Helloworld Wellington Centre in Hobart. Having recently bought the Helloworld agency, which had already experienced a brand refresh last November, hers is a position of cautious optimism. "While I was not involved directly in the rebranding process, there have been a few teething problems with the agency and I still don't understand or know exactly what support is offered to new owners," Daley said. It is not hard, in the period following such a significant brand refresh and wholesale change, to imagine that other recent converts to the Helloworld cause would feel the same way. Daley's position is also likely to be more in line with the experience of rank and file agency owners, in contrast to the atypically close relationship that a larger operation such as Phil Hoffmann Travel has enjoyed with head office. But senior management can take solace from the fact that these new Helloworld agency owners will be determined to succeed and, by and large, will give the company supremos the benefit of the doubt. "I suppose once my own processes are bedded down I can start asking more questions and will get some more support. I understand there have been changes at head office as well and I expect the support and company direction will improve in the next six months when everyone is comfortable in their jobs," Daley said. Clearly over the past year a key pillar of strategy for Helloworld has been to convince ex-JTG agents to march under the new banner. In terms of early recruits, Phil Hoffmann Travel certainly represented a big scalp, but other high profile agencies such as Penny Spencer Travel were not able to be wooed. Spencer was candid about her commercial decision making, telling Travel Weekly that moving her business over to Magellan Travel was the right decision at the right time. Her own process of due diligence over the course of a year included looking at the offerings of both Helloworld, Magellan Travel and other networks she was reluctant to name. "I like the way Magellan has very low overheads and gives everything they receive back to the agents. That is what made them the most compelling network for me," Spencer said. "We have open conversations with our suppliers and we are part of a network that involves its members in some of the decision making. Being on the board of Magellan Travel has also helped me grow in my career," she added. Warwick Gladman, owner of Green Hills Travel in Maitland, New South Wales is another who rejected overtures to join Helloworld's ranks. His agency, formerly a Harvey World Travel outlet is now a Travellers Choice member and Gladman has no regrets. "Firstly, the contract they [Helloworld] offered me was like Gone With The Wind, it was so long. Additionally, the rebrand meant that there could have been potentially eight Helloworld agencies in the Maitland area. It was already confusing enough having three Harvey World Travel agencies in the vicinity," Gladman said. The issue of the franchise fee was also a sticking point for Gladman. "I couldn't see the value in such high franchise fees. With Travellers Choice every agency is an equal shareholder and there are no franchise fees upfront," Gladman added. These reservations and other, likely more frivolous concerns, have all meant that Helloworld's first year has been one of challenges, providing senior management with many hurdles to jump. Undoubtedly difficulties were expected upon embarking on such a sweeping rebrand. And yet with the 1000 branded outlet targets in reach, there's every reason to expect year two will be a smoother one. After all, there are other reasons to be positive. The new name and refreshed livery have provided an aesthetic change and one that is clearly being noticed. "Our franchisees are telling us that customers like the brand as well as the contemporary look and feel of the retail stores. They are bright, modern and spacious and our agents and members are finding that the rebrand has been a staff morale booster and has attracted new customers to their stores," Gaines said. A single channel in marketing terms is another plus that Helloworld management would no doubt have been at pains to push to those wavering over whether to take the plunge and rebrand. "Our network of agents is benefiting from a shared voice under one unified brand, supported by a consolidated marketing investment. Our integrated marketing campaigns appear across a range of media including digital channels, TV, radio and in print," Gaines said. But perhaps most pertinently, Gaines' recent appointment gives her the chance to become a galvanising figurehead and bring stability where Gurney could not. Without question, a stable and effective board of directors can only engender more confidence in the lower ranks of the business. Mary Shelley may have been on to something with her summation of change, but the parallels with her novelistic character don't end there. While only the most ardent critics would consider the creation of Helloworld a monstrosity, its first year will have taught those at the top that there are unforseen factors that can slip from their control. But with managerial stability, inspiring leadership and financial success, Helloworld might yet confound the naysayers and become retail travel's most beautiful creation in years. Agent wrap: Helloworld says thanks, agents explore Egypt, Dubai incentive winner + more! Do you experience a bad case of FOMO when you see fellow agents living it up on famils? You might want to skip this one.